Students interact with each other as Rabbi Dr. Yossi Kastan leads a discussion on self-empowerment. Nick Albicocco/Mitzpeh. 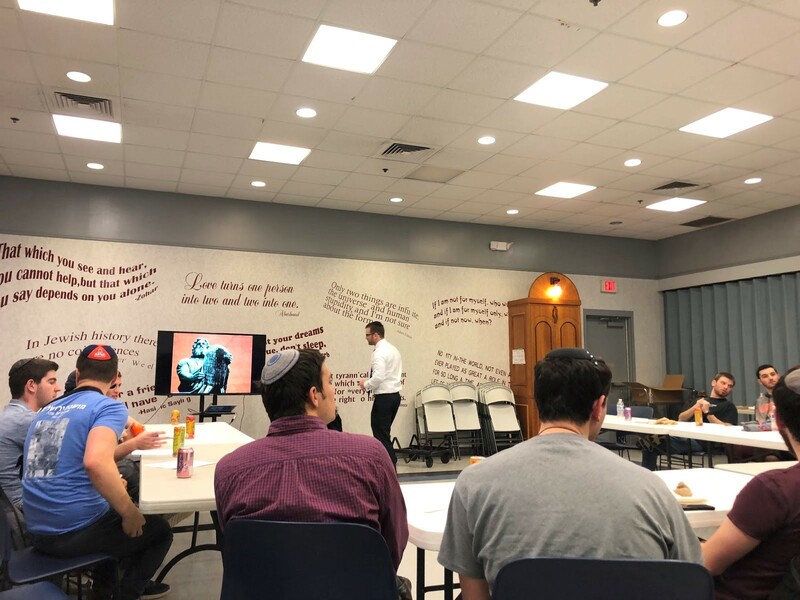 Maryland Hillel received a visit on Feb. 25 from Rabbi Dr. Yossi Kastan, who spent an hour empowering students with a discussion about courage and leadership, overcoming fear and perfectionism and acting yourself. The event marked Kastan’s first speaking appearance at a university, and he said he came to meet and engage with alumni, as well as talk to future Jewish leaders about authentic leadership. Kastan handed out a double-sided sheet at the beginning of the discussion that featured excerpts from the Book of Genesis. The excerpts revolved around an interaction between God and a naked Adam, and the students eventually paired up and discussed times in which they previously felt naked or afraid. The rabbi shared a story from a few months ago about how he felt “naked” because he showed up for a night of dinner and ice skating in casual clothing, only to see everybody else in suits and dresses. Kastan admitted that he hid in his car embarrassed for an hour but eventually overcame his fear. The discussion concluded with a brief talk about courage. Students used their example from the second exercise and answered how they would respond if that specific situation arose again. At the conclusion of the talk, Kastan received a loud ovation from the packed audience. Many of the students in attendance were impressed with Kastan. “I enjoyed the whole thing. I liked how it was presented and how it was more interactive with getting us to think about each point and then going on to give an explanation beforehand and after,” said sophomore geology major Jeremy Kardon. No Replies to "Rabbi visits Hillel for discussion about courage, leadership"